Irish history sounds a long litany of grievance and vengeance—lost battles, escaped earls, and institutionalized injustice. The gun, certainly in this century, has played a prominent part. In The Gun in Politics, J. Bowyer Bell presents the story of one Ireland—the Ireland of the Troubles—and about an approach to understanding political violence. In particular, he examines the Irish Republic Army, the longest-enduring unsuccessful revolutionary organization. He de-scribes the covert world of gunmen and the great game they play in the street. His is a lively, telling account of sophisticated weapons transfer, of the impact of civil war on society, and of appropriate democratic responses to terrorism. 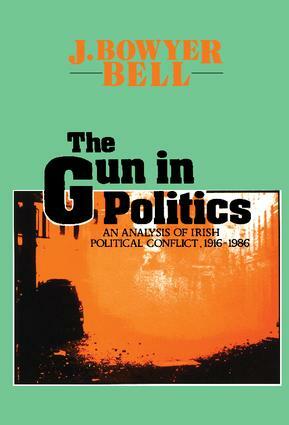 Bell's association with active Republicans, his endless tea seminars at the United Irishman, drinks at Hennessy's, and constant conversation throughout Ireland on political matters over a period of twenty years has provided the author with unique background for this guide to a fascinating, though brutal, undercurrent of Irish history.